I own a 2011 model of MacBook Pro with a Core i7 processor and Snow Leopard. I have found out there is a trojan horse which now controls 600,000 Macs. How can I find out if my MacBook is being controlled? Apple has released an official tool for uninstalling the malware. Read about it and download it on this Apple KB page. F-Secure has also released a removal tool, which you can download here. This is for your relatives and friends that want to avoid using the Terminal. Download this free app from Github. 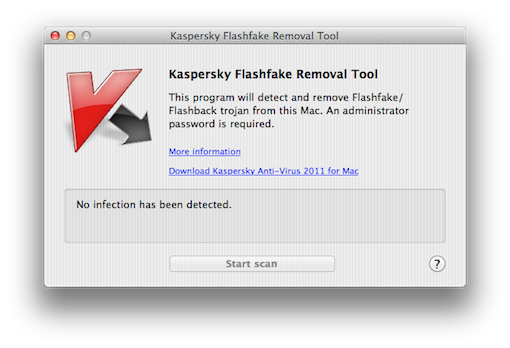 As referenced in this Macworld article, the single-function app will quickly check your machine for the infection. The app doesn't remove the malware, which will be left up to the user by manually following the instructions from F-secure. Here is an Apple support article about the security content of the Java updates. defaults read /Applications/Safari.app/Contents/Info LSEnvironment &> /dev/null && echo "You seem to have Type 1"; defaults read ~/.MacOSX/environment DYLD_INSERT_LIBRARIES &> /dev/null && echo "You seem to have Type 2"
Unless this outputs anything, you're clean (at least of the known types). If it does say something, go clean up. Not the answer you're looking for? Browse other questions tagged security malware . 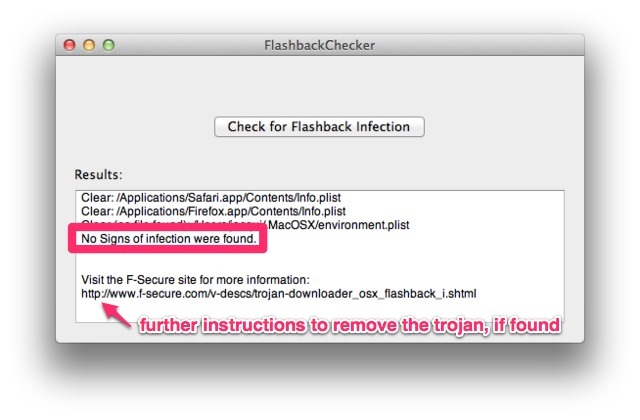 Can I determine how the Flashback trojan infected my machine despite disabling Java? How do I check to see if my computer is infected with the OSX/Crisis Trojan? What launches an ancient “Update Helper” and how do I confirm it's not a trojan?